The Parish News is published as a joint newsletter for the parishes of St Peter's Heversham, St John's Levens and St Thomas Milnthorpe. There are 10 issues a year (joint December/January and August/September issues) and 2,000+ are printed and distributed to all houses/businesses in the Heversham, Levens and Milnthorpe Parishes by 3 dedicated village teams. 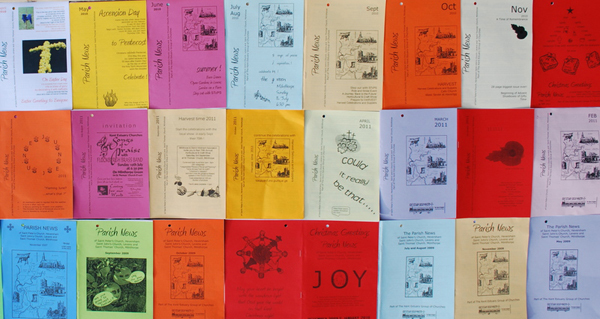 The Parish News is also available in Adobe Acrobat PDF format for download from here (some of the files are large), as below. Jill Butterworth, Jane Cushnie, John Thorley, Margaret Barrow and Wendy Dodds. OUR COVER was designed by Daphne Lester who has had several illustrated maps hung in the Milnthorpe Art Exhibition. 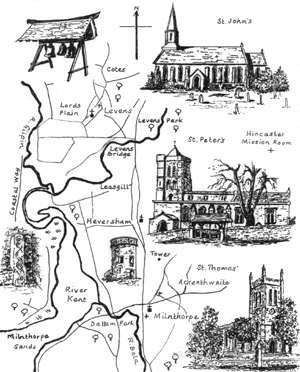 This map drawn for our HLM Parish News really illustrates how we are linked together. The Bells: In 1869 three steel bells were acquired by St Thomas' Church and were given to Levens church in 1912. The three bells are still at Levens church, not in the tower but in a timber frame in the churchyard near the north-west corner of the church. The 7th century cross-shaft is situated in the porch at St Peter's Church. St Anthony's Tower is a landmark seen from all directions when approaching Milnthorpe.